The nettle is well known for its toothed, hairy leaves and for its sting. The painful sensation of nettle stings occurs when toxins from specialised hairs are delivered into the skin. Each stinging hair has a bulbous tip which breaks off to leave a sharp, needle-like tube that pierces the skin and injects histamine and acetylcholine, causing itching and burning that may last up to 12 hours. Naturalizada en Colombia; Alt. 2440 - 2600 m.; Andes. The nettle is one of the most useful plants in Britain and even its sting can be beneficial. The painful sensation of nettle stings occurs when toxins from specialised hairs are delivered into the skin. Each stinging hair has a bulbous tip which breaks off to leave a sharp, needle-like tube that pierces the skin and injects histamine and acetylcholine, causing itching and burning that may last up to 12 hours. Urtica dioica is widespread through Europe and North America, and also occurs in North Africa and parts of Asia. There are naturalised populations in several other parts of the world. This species is a herbaceous perennial, which grows as an upright plant to 2 m tall. The soft, serrated leaves are opposite each other in pairs on the stem. The leaves and the rest of the plant are coated in stinging and non-stinging hairs. The plant spreads by underground roots which are noticeably yellow. The tiny greenish-white flowers, each with four petals, are densely clustered on elongated inflorescences towards the top of the stem. Urtica dioica is divided into at least five subspecies, each of which is slightly different. This plant is not threatened and is a common weed. The stinging nettle is of great benefit to UK wildlife, and its growth is often actively encouraged by conservation groups. It supports over 40 species of insects, including small tortoiseshell and peacock butterflies. Nettles have been used for centuries for a multitude of purposes, and continue to be harvested from the wild for food and medicine today. Nettles are eaten as a vegetable; cooking will destroy the stings. The tender, young shoots and leaves - the most palatable parts - are the main ingredient in nettle soup, which has a reputation for 'cleansing the blood'. Historically, puddings and beer were made with nettles. Today, the mature leaves are used in the production of cheese (notably Cornish Yarg) and in pesto, cordials and herbal tea. 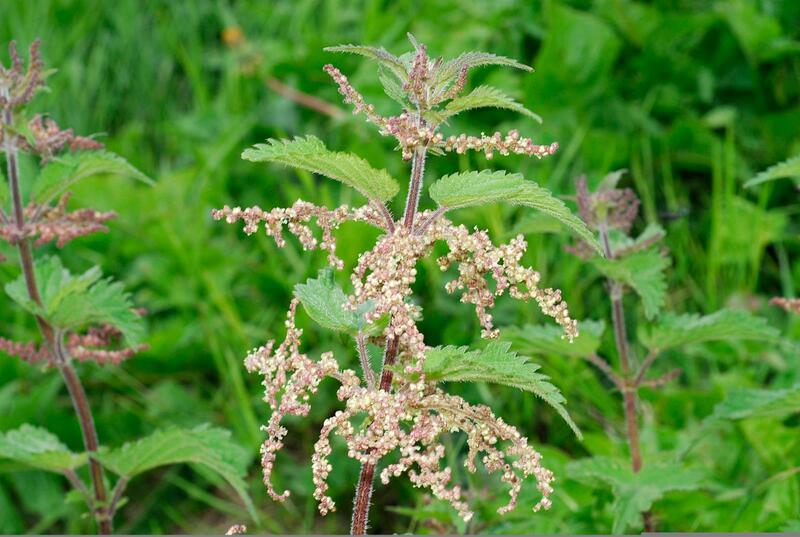 Nettles have also been used to yield vegetable protein similar to tofu made from soya ( Glycine max ). In some parts of Britain (eg Orkney) the leaves are traditionally fed to pigs to fatten them. 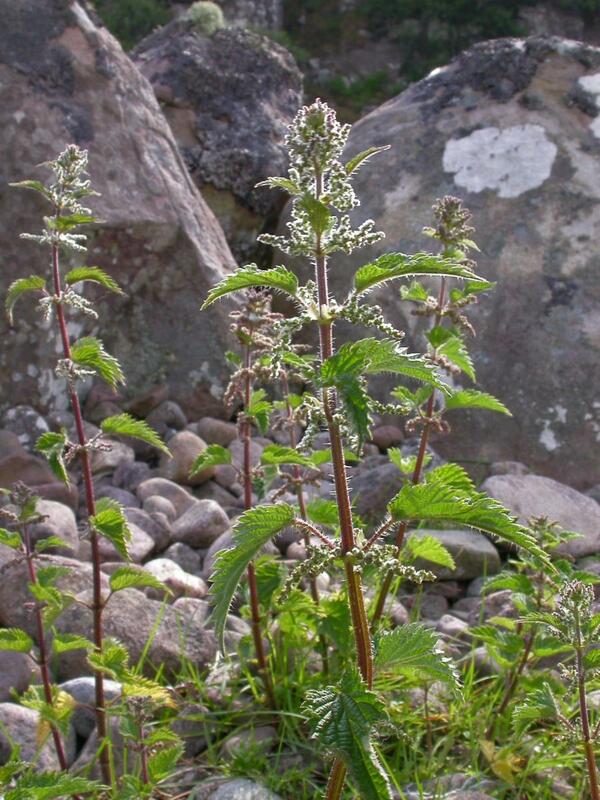 Nettles have been used for a variety of medicinal purposes. A tonic prepared from the leaves is still among the most popular plant remedies used today. One traditional remedy for rheumatism involves deliberately stinging the afflicted area with nettle leaves! While this may seem strange, research has shown that nettle stings have anti-inflammatory properties that disrupt the NF-κB pathway and inhibit other inflammatory responses. Extracts of the root are used to treat benign prostate hyperplasia. 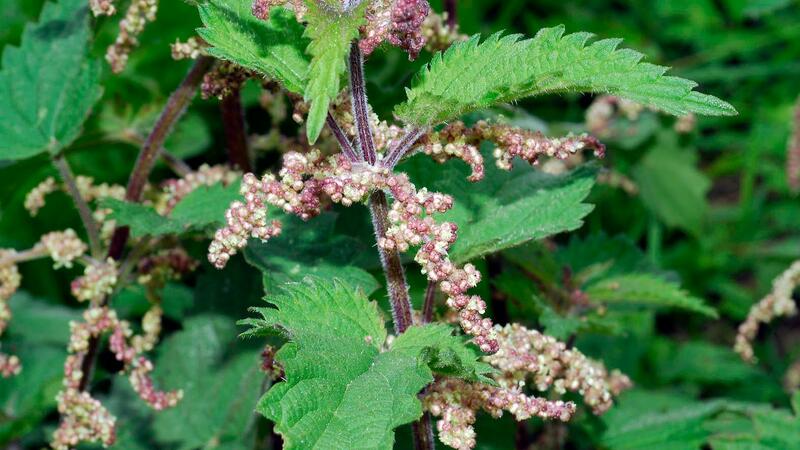 Scientists have identified a variety of biochemical properties in extracts of nettles that support their uses in herbal medicine. Nettle stems contain tough fibres and can be used in textiles; the fibre was widely used to this effect in Germany and Austria during the First World War. 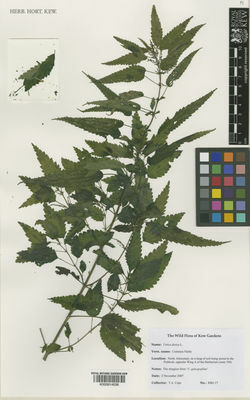 Nettles can also be used for dyeing fabric. Horticulturalists sometimes use nettles, which are rich in nutrients, to produce a type of liquid plant feed. The leaves are used in cosmetics. Although not cultivated at Kew, this perennial species is planted as a crop elsewhere. Until recently it was cultivated in Scotland, Denmark and Norway for use in food, textile and medical industries. This species can be propagated by seed or by rhizome (that is an underground stem that grows horizontally) division. Abundant seed is produced and can be collected in late autumn, before frost causes seed-fall. The seed does not pass through a dormant stage and can germinate just days after maturity. Open ground is preferred for germination. Rhizome division can be carried out from spring through to late summer. As deep, rich soils are preferred by this species, a substrate rich in organic matter is recommended, with nutrition added. This species responds well to generous watering. Given the tendency to flop, it is recommended that nettles be grown with support, such as that provided by pea sticks if a neat appearance is required. Control of the spread of the rhizomes can be carried out by using a pot or polyurethane barrier in the soil. If the purpose of cultivation is to provide for butterflies, large discrete clumps should be grown where eggs will usually be laid on leaves on the outside of the clumps. As young foliage is generally preferred, cutting can be carried out to produce fresh growth. Gloves are required for handling the plants. This species is not cultivated at Kew. However, a natural population is allowed to grow in the Natural Areas (Conservation Area) where it is of benefit to the native fauna. Nettles can usually be seen close to the Badger Sett. Nettles are a food source for many butterfly and moth larvae, and ladybirds benefit from the aphids that thrive there. The numerous seeds produced in late summer are an important food source for many native birds. What would you use nettles for? 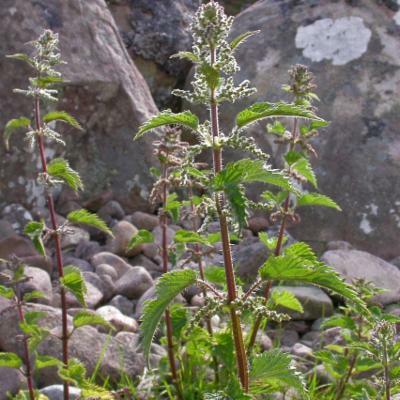 Nettles are one of the popular plant remedies used in the United Kingdom. Kew is collecting people's memories of nettles and other plant remedies for the Ethnomedica project. 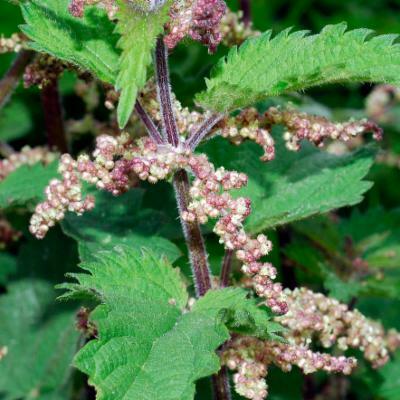 Many people remember using nettles in a tonic and to relieve rheumatism. What would you use nettles for? If you would like to share your remembered remedies with us, please email ethnomedica@kew.org. Wasteland, hedgerows, fields and woods. Nettles do particularly well in soils with high levels of nitrogen and are often found growing around abandoned buildings. Classified as Least Concern by IUCN Red List criteria. Nettle stings are irritating and poisonous but are very rarely serious. Alt. 2440 - 2600 m.
Food, medicine, textiles, plant feed, cosmetics. Leaves - Used in liquid medicines (Florez-Cárdenas et al. 2010). Leaves - Used in liquid medicines as a diuretic (Lagos-López 2007). Used in poultices; used in liquid medicines to treat rheumatism (Florez-Cárdenas et al. 2010). Used in the treatment of hair loss (Florez-Cárdenas et al. 2010). Leaves - Used in liquid medicines in the treatment of skin allergies (Lagos-López 2007). Social uses (State of the World's Plants 2016). Urtica sicula Gasp. ex Guss. Weigend, M. & Luebert, F. (2009). Weeding the nettles I: Clarifying species limits in perennial, rhizomatous Urtica (Urticaceae) from southern and central Chile and Argentina Phytotaxa 2: 1-12. USDA Forestry Service (2009). Index of Species Information: Urtica dioica (accessed online 29 September 2009). Jellin, J.M., Gregory, P.J., et al. (2008). Pharmacist's Letter/Prescriber's Letter Natural Medicines Comprehensive Database. 10th Ed. Therapeutic Research Faculty, Stockton. Davidson, A. (2006). The Oxford Companion to Food. 2nd Ed.Oxford University Press, Oxford. Warren, P. (2006). 101 uses for stinging nettles. Wildeye, UK. Milliken, W. & Bridgewater, S. (2004). Flora Celtica – People and Plants in Scotland. Birlinn, Edinburgh. Prendergast, H.D.V. & Sanderson, H. (2004). Britain's Wild Harvest: the Commercial Uses of Wild Plants and Fungi. Royal Botanic Gardens, Kew. Williamson, E.M. (2003). Potter's Herbal Cyclopaedia. C.W. Daniel, Saffron Walden. Riehemann, K. (1999). 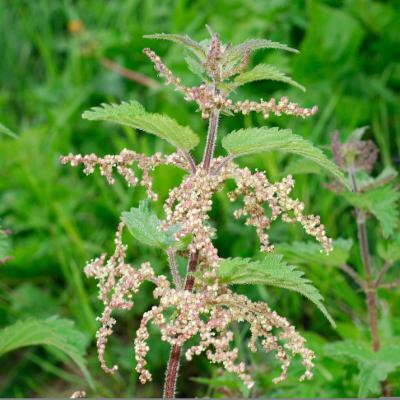 Plant extracts from stinging nettle ( Urtica dioica), an antirheumatic remedy, inhibit the proinflammatory transcription factor NF-κB. FEBS Letters. 442: 89-94. Dennis, L. (ed.) (1992). The Ecology of Butterflies in Britain. Oxford University Press, Oxford. Grieve, M. (1984). A Modern Herbal. Edited by Mrs C. F. Leyel. Savvas Publishing, Adelaide; Jonathan Cape Limited, London. Stuart, M. (ed.) (1979). Encyclopedia of Herbs and Herbalism. Orbis, London. Thurston, E.L. (1974). Morphology, fine structure and ontogeny of the stinging emergence of Urtica dioica. American Journal of Botany. 67: 809-817.